Probably one of the most iconic vehicles of the Second World War the Jeep as it became known was originally designed by Willys, but such was the demand that the bigger manufacturers such as Ford had to get involved in building them to supply the armed forces. The vehicle was used in every theatre of war from the desert to the jungle and with every branch of the services. 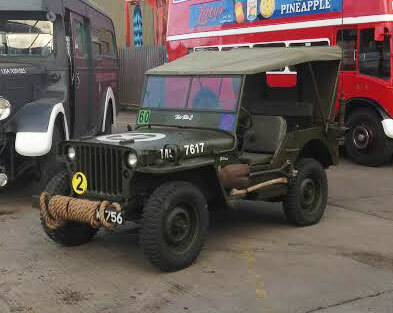 Ford and Willys combined, supplied nearly 650,000 of them during WW2. Some 200,000 of these Jeeps would pass to either British or Soviet forces through Lend Lease. Always a head turner a great vehicle for either small parties who want to arrive in something completely different, as a back drop to your event or for a 40s themed show. It has a fully removable remove so can operate whatever the weather. 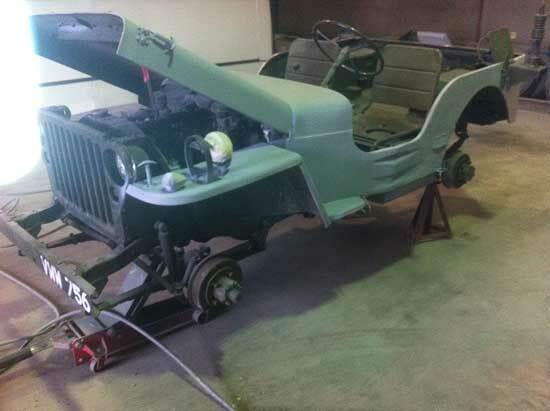 Our Jeep is a Ford GPW with chassis number 157007 and was built under contract F-4, which was for 78,574 jeeps, covering serials 101305-179758. It is believed the vehicle was built at the huge Dallas, Texas plant as this factory crated them and sent them direct to the front and the batch our vehicle sits in appears all to have been crated and sent directly to the UK to be reassembled. Its chassis number tells us it was completed in November 1943, along with 7,224 others that month, in the range 155261-162485, making the likely completion date around November 7-8, 1943. 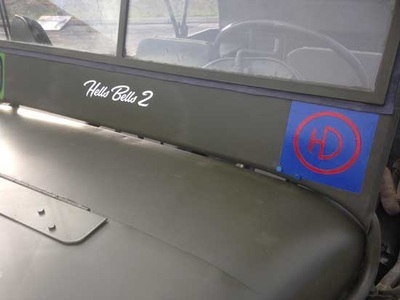 Initially the vehicle was allocated to the US Military where it received a hood number estimated at 20420565, although as US records don’t survive its impossible to confirm exactly the number but during restoration the final digits 9649 were found so it may well have been 20419649, an S was also found pointing to the fact it was probably a signals Jeep. 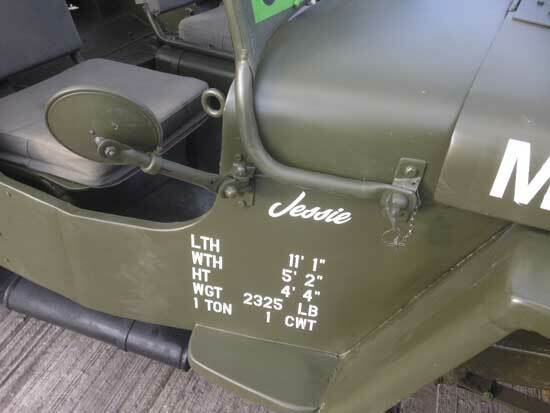 As mentioned it is believed the vehicle was one of the ‘crated’ Jeeps and was reassembled at various depots across the UK but was possibly put back together at Ordnance Depot Q 640 at Tidworth, Wiltshire, or Depot 0-Q63 at Arrowe Park, Cheltenham. 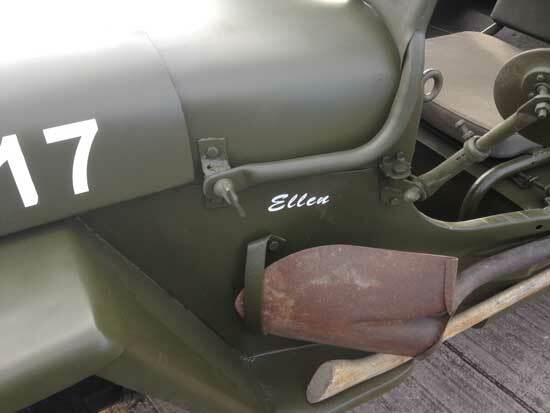 Having joined the US forces in the UK it was then passed over to the British under the lend lease contract SM2275 where it received the British serial number M5557617, which it again wears today. This was found under the paint and was then confirmed by the Royal Logistic Corps Musuem who still hold the post war cards for British Jeeps, which confirm their wartime identity. 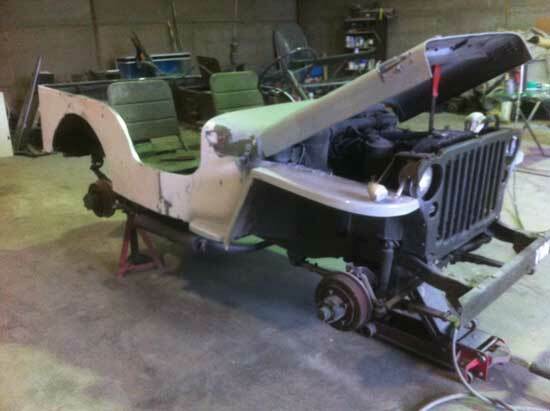 During the war her exact history is unknown but various damage was found throughout the body work as well as various markings pointing towards the view that she probably continued in the role as a signals Jeep. Under the 1948-49 renumbering system the serial number was replaced with a registration number plate system and thus she became the British Army Reg 58 YH 66. She was demobbed 6 September 1957 and passed through three owners having initially been based on a farm in Wales before we acquired it in 1995. Having been used very little in that time major work was carried out in the winter of 2013/14, that saw a new engine fitted, body work repaired and finally a repaint. She is now finished in the colours of the 5th Battalion Black Watch who were part of 51st Highland Division under Montgomery and who had fought with him in North Africa and landed again under his command in Normandy.